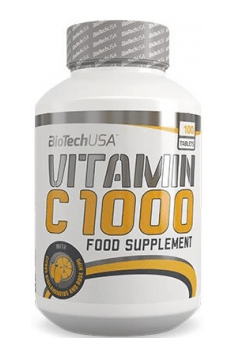 BioTech Vitamin C 1000 is a supplement, which enriches diet in a high dose of vitamin C. Its activity is strengthened by citrus bioflavonoids and dog rose extract present in the preparation. The supplement allows to easily and safely increase the supply of vitamin C. It is especially recommended to people, who don’t care about proper diet, eat few fruits and vegetables or are addicted to nicotine. It is also worth taking it in the season of flus and colds. Vitamin C is one of the best-known and the most biologically active vitamins. It takes part in many biochemical reactions and conditions proper course of many metabolic processes. It is also one of the strongest known antioxidants. Dog rose (Rosa canina) is a plant incredibly valued in pharmacopoeia. For therapeutic purposes both fruits and flowers are used. They contain high concentration of natural vitamin C, antioxidants and galactolipids - unique substances with anti-inflammatory effect. Bioflavonoids is a group of chemical compounds belonging to polyphenols. They are secondary products of plant metabolism. Especially citrus fruits are characterized by the high content of bioflavonoids. These compounds are valued primarily for their anti-inflammatory and antioxidant effects. They work synergistically with vitamin C, prolong its time of biological activity in the organism and strengthen the functions that it plays. Vitamin C is conducive to increasing immunity. When used in the period of flu and colds, it may decrease the frequency of infections, shorten the time of the disease and alleviate its course. Vitamin C in the organism is used i.a. for the production of cells of the immune system (e.g. lymphocytes B and T), which are responsible for the protection of the organism against pathogens. Moreover, it stimulates the activity of NK cells and stimulates the process of phagocytosis, consisting in absorbing pathological or infected cells. Vitamin C is one of the most powerful antioxidants. Due to its specific chemical structure it has high ability to neutralize reactive oxygen forms and protects cells from oxidative stress. It may play the function of electron donor, which accelerates the pace of reaction redox in the presence of metals dangerous to health. In this way, it inhibits the organism’s aging and decreases the risk of diseases, which are caused by the excess of free radicals. Vitamin C is engaged in collagen biosynthesis. This protein constitutes the main building element of connective tissue, is present in teeth, bones, joint cartilages and skin. Vitamin C deficiency may impair the transformations of procollagen into collagen proper. As a result, the tightness of blood vessels is decreased, skin loses elasticity and disfunctions in the musculoskeletal system may appear. Vitamin C regulates the work of the nervous system. It modulates the systems of a few important neurotransmitters (cholinergic, catecholaminergic and glutaminergic), demonstrates neuroprotective effect. Increasing the supply of vitamin C allows to eliminate the feeling of excessive fatigue and weariness, has positive influence on cognitive health and according to some sources, it may also decrease the symptoms of depression. Vitamin C may inhibit excessive production of cortisol in response to stress. It was proven in the studies that people prone to physical or mental stress, who obtained high doses of vitamin C had lower level of cortisol and lower blood pressure than a control group that obtained placebo. Vitamin C increases availability of nutrients. It positively influences especially the absorption of calcium and non-heme iron. It is especially important for people, who do not eat meat, as iron present in vegetable products is considered very hard to assimilate. To sum up, BioTech Vitamin C 1000 is an easy way to increase the supply of vitamin C and complement potential deficiencies. The supplement is especially recommended to smokers, may be helpful also in problems with fragility of blood vessels and deterioration of the state of skin. When used in the season of increased frequency of flus and colds, it will boost immunity and limit the risk of infections. Vitamin C 1000 + Citrus Bioflavonoids 100 tab. Take 1 tablet a day. The supplement enriches diet in a large dose of vitamin C and the components strengthening its activity. As prophylaxis, take 1 tablet a day. The dose may be increased during infections. Vitamin C is soluble in water, therefore it does not need to be applied with a meal. People who practice sport need to remember that reactive oxygen forms that are produced during intensive physical effort are important for effort adaptation. High doses of vitamin C will block this process, therefore the supplement is worth using away from workout. Coating material: hydroxypropyl methyl cellulose, microcrystalline cellulose, magnesium stearate, stearic acid. High quality extract from red clover. It supplements the therapy of menopause in women. Supports healthy immune function and promotes the growth of beneficial bacteria. Supplement with powdered oregano leaves. Shows antioxidant and anti-inflammatory potential. Citrus bioflavonoids (flavanones) - are found in citrus fruits (oranges and bitter grapefruit) and contain naringenin and naringenin with a strong antioxidant and anti-inflammatory action and enhancing metabolism of a number of substances. Increase immunity and strengthen the walls of blood vessels. Reduce the secretion of cortisol, while increasing the norepinephrine hormone allowing for the reduction of body fat. Citrus flavonoids are an ingredient of supplements in the category of "health and beauty", vitaminizing supplements, thermogenics, herbal blends supporting the functioning of the endocrine system.